Atlanta Falcon’s quarterback, Matt Ryan, met with the media after Thursday’s practice, along with owner and chairman Arthur Blank, general manager Thomas Dimitroff and head coach Mike Smith, to discuss his new five-year extension with the Falcons worth $103.75 million, which over the long course of the agreement is $20.75 million per year, making the deal second among quarterbacks in new money only behind Aaron Rodgers. Photo shows Atlanta Falcons quarterback, Matt Ryan, speaking with the media after a practice session on Thursday, July 26, to discuss his new 5-year extension with the Atlanta Falcons..
As far as the guaranteed money, says NFL reporter, Ian Rapoport, it’s $59 million guaranteed and over the course of the first three years of his contract extension, it’s $63 million which is top among all quarterbacks. When you consider the fact that Matt Ryan is due $10 million this year, he is locked up with the Falcons for the next six years. Ryan, who came so close to reaching the Super Bowl last year, struck a deal which now exceeds Super Bowl MVP Joe Flacco’s $20.1 million average which Flacco received last March with the Baltimore Ravens with his six-year, $120.6 million deal, at that time making it the biggest deal in NFL history. Ryan is the only Falcons quarterback to lead the team to an 8-0 start (2012). Ryan’s achievements include 2× Pro Bowl (2010, 2012), 3x Pepsi NFL Rookie of the Week winner, AP Offensive Rookie of the Year (2008), Rookie of the Year by Sporting News (2008), All-Rookie Team by Sporting News (2008) and NFC Rookie of the Month (October 2008). Ryan is also an avid golfer and has hosted numerous celebrity golf tournaments for charity. 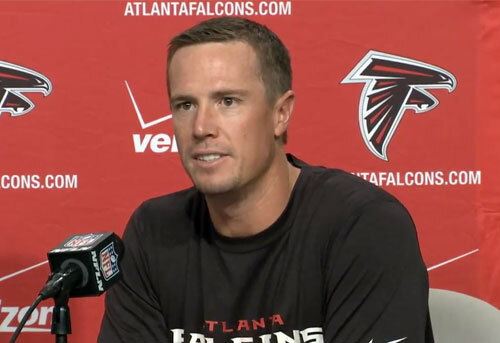 If you would like to book football speakers or athletes like Matt Ryan for a speaking engagement, autograph signing, product endorsement, Super Bowl party, golf tournament, charity fundraiser or special event, you can request Matt Ryan booking agent and speaker fees at Sports Speakers 360. For booking agent and appearance fee information on how to hire Atlanta Falcons players for appearances, call 1.855.303.5450.